I have a Saturday morning ritual. After I wipe the sleep from my eyes, I grab some strong coffee, then make my way to a farmers’ market. This happens no matter where I am in the world. If it’s the weekend, I will find a farmers’ market. And after a long winter nothing is more welcome than the sight of fresh green springtime produce. My favorite way to showcase spring’s bounty is with a simple nourishing risotto. Like many of you, I’ve always been under the assumption that whole grains are superior to milled grains. Not until I came across the work of Paul Jaminet (author of the Perfect Health Diet) at Wise Traditions a few years ago did it occur to me that white rice could be healthful. According to Dr. Jaminet, the key to a healthy diet is minimizing toxicity. Since almost all of the toxins found in rice are within the bran, cooked white rice is just that, low in toxins. In fact, cooked white rice has lower amounts of phytic acid then almost all other seeds, nuts, grains, and legumes. I’ve also found that I prefer it for it’s ease of digestibility as brown rice has never agreed with me. White rice as a part of a nutrient dense diet (full of seafood, offal, and bone broth) is not problem for my family. Early on in my cooking adventures, I was intimated by risotto. It seemed like a finicky endeavor, and what was with the cream in some recipes? Carnaroli rice cleared it all up for me. Known as the king of rices in Italy, carnaroli rice is a short grain rice that has a higher proportion of amylopectin compared to other risotto rice varieties like arborio or baldo, and amylopectin is the starch that gives risotto its trademark creaminess. Often, risotto recipes that don’t use carnaroli rice have to add cream to get the right texture. While I love cream, it really has no place in a simple risotto. There’s need to “cheat” with carnaroli rice; its superior starch content will provide more than enough velvety creaminess. On top of that, carnaroli rice is better at absorbing all of the flavor and gelatin-rich broth you add to it, and it’s also resistant to overcooking. That resistance to overcooking is what makes this risotto particularly easy to make at home. Homemade broth made in my pressure cooker is a cornerstone of my family’s diet. We rely on soups, stews, and broth-rich risottos like this one year-round. I cherish broth for its high gelatin content. Gelatin has been mentioned here before (read all about it here and here) but it always warrants repeating. It’s the most abundant protein in our body and it’s what makes our skin, hair, nails, joints, and connective tissue strong and flexible. It also soothes the digestive tract and is easy for the body to assimilate. I often make risotto or a rice-based soup (Vietnamese-syle Tomato Rice Soup has been a favorite in my household) when we are down with a stomach bug or have any type of gastric distress. The wonderful thing about risotto is that it can be a blank canvas for your creativity. Making a trip to the nearest farmers’ market can serve as great inspiration. Produce that grows in-season together is very tasty together more often than not. Mixing and matching flavors and even trying new flavors are all possible. Most times I walk away with a variety of vegetable or fruit that I’ve never tried. Growing up my grandmother always balked at grocery store tomatoes and said they didn’t taste like “real” tomatoes. It wasn’t until I started eating in-season produce that I understood what she meant. Nothing beats the flavor of fresh, sun-ripened, and just-picked produce. I also prefer supporting local farmers over corporate multi-national grocery stores. I can look into the eye of the man or woman that grew the food and ask them about their farming practices to ensure it meets my expectations. 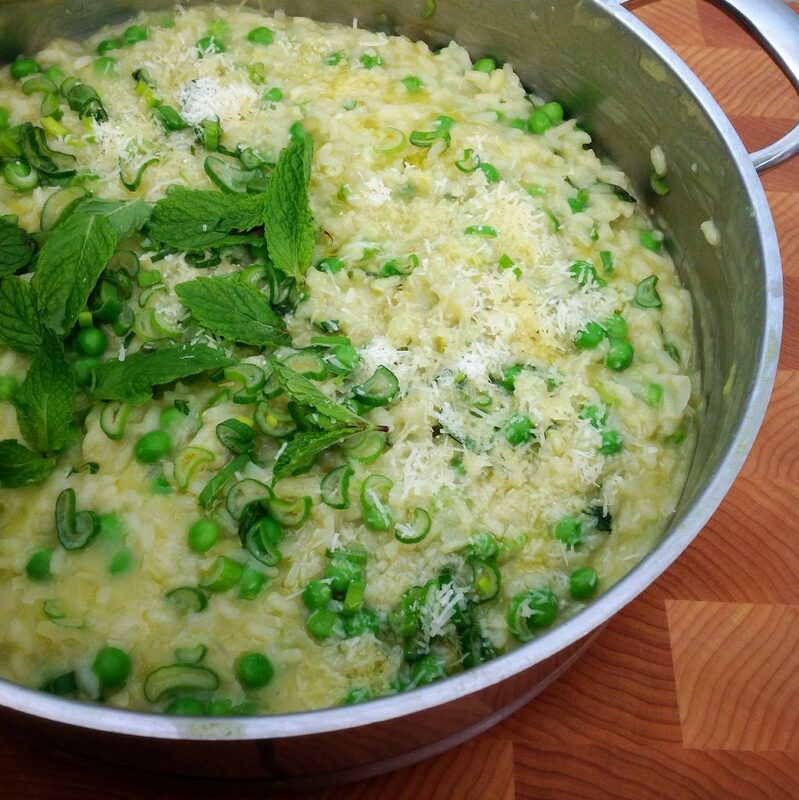 Showcase spring's wonderful fresh green bounty with a nourishing simple risotto. Dotted with sweet peas, pleasantly pungent scallions, and refreshing mint. Heat salted water in a small pot and blanch peas. It takes about 1-2 minutes and they will float to the top. Drain and submerge peas in cold icy water and set aside. Warm chicken broth in small saucepan. I like to add a parmesan rind to the broth while it warms. Heat olive oil in a heavy bottom pan over medium high heat. Add shallots, light-colored portion of spring onions and a large pinch of sea salt. Sauté until alliums are translucent, about 4 minutes. Don't allow them to brown, lower the heat if necessary. Add grated garlic and stir constantly for 30 seconds then add rice and sauté for another 4 minutes. Again, avoid browning. Add white wine and allow to cook off and absorb into rice. Using a ladle, add broth one ladle at a time until absorbed. No need to constantly stir, but it is a good idea to keep an eye on it and stir frequently. While rice is cooking take 1 cup of peas and blend in your blender with a few ladles of warmed chicken broth. Set aside, and when you have finished all of the broth in your saucepan add the green pea broth and allow the rice to absorb it. It takes about 40 minutes for the rice to absorb the entire amount of liquid. At the 40 minute mark, check the rice for doneness, it should creamy and slightly al-dente. Also add salt to taste at this time. If you are using homemade broth, it will likely need more salt than store bought broth. Stir in chilled blanched peas, chopped scallions and mint. Garnish with freshly grated parmesan and mint leaves. Drizzle with a little extra virgin olive oil. Serve immediately. Made this on Sunday, it was quite delicious. I never used to pay attention to the type of rice I used, didn’t know that mattered until now. Thanks for the recipe and tips. Yea, switching to carnaroli rice was a game changer for me. So glad you enjoyed. I’ve made carnaroli risotto with peas and asparagus many times, but I like the idea of trying it with peas and mint instead. I bet this would be yummy with some lemon juice and zest and mascarpone stirred in at the end. The Barefoot Contessa recipe that I’ve used the most calls for that. Lemon and mascarpone sound like a great addition. Let me know if you try it and how it came out.